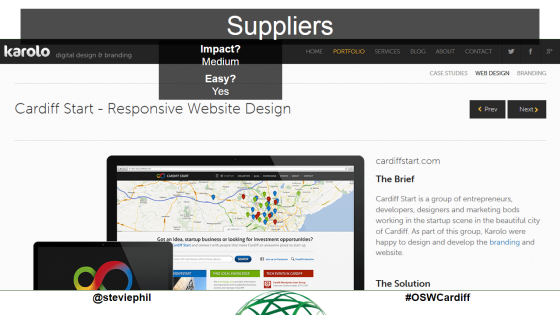 On Thursday 20th February, I gave a talk at Online Seller Wales, for their Cardiff event (#OSWCardiff) in Porter’s Bar’s cinema room. I’ve spoken in the venue’s cinema room before for my Cardiff Internet talk (and I’ve also spoken on their main room’s stage for my Ignite Cardiff talk) – it’s a great venue. The talk title? 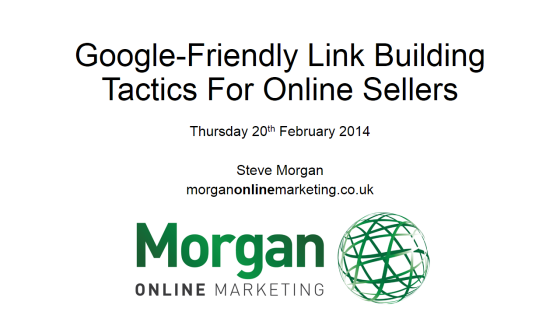 Google-Friendly Link Building Tactics For Online Sellers. In other words, white-hat link building and link earning tips primarily aimed at eCommerce businesses. 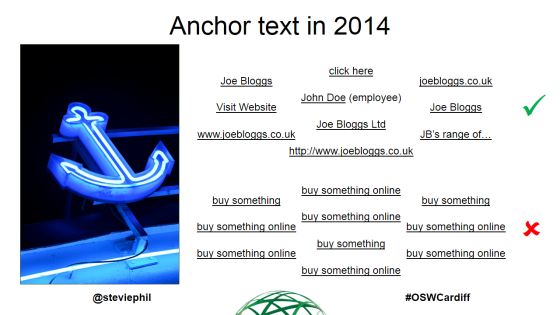 I also talk about Google’s stance on link building (what with things like Google Penguin, Manual Actions and the disavow tool) and also give advice on anchor text etiquette in 2014 and beyond. 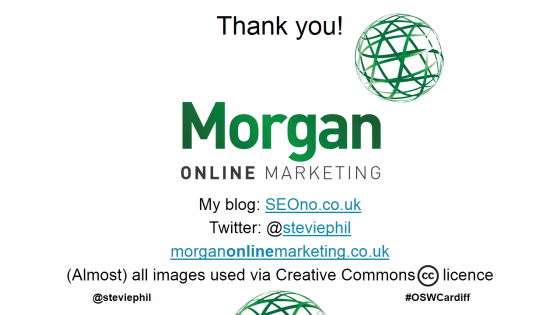 I’d like to say a big thank you to Gaz Copeland of Stoked SEO (@StokedSEO) for giving me advice and feedback on my slides when I was working on them. A quick disclaimer: I had a technical issue where some of the slides would automatically move onto the next slide without my pressing anything, so I found myself talking quite quickly in an attempt to counteract it. So apologies if it sounds a bit frantic, hehe…! Steve: Hello everyone, my name is Steve Morgan. Thank you to Prabhat for having me this evening. 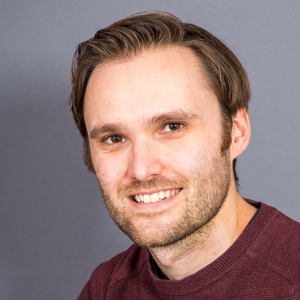 I won’t tell you my life story, but I’ve been doing SEO full-time now for about five years, mostly for a couple of agencies locally, I worked briefly in-house, and about nine months ago I went self-employed as a freelance consultant. I’ve got a bit of a cold, so hopefully my voice will last. I’m going to be talking about white-hat link building tactics for eCommerce sites/online sellers. 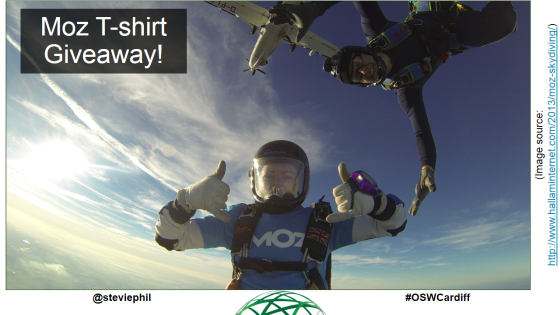 One thing I’m going to be doing as well is that I’ve got a prize to give away, so for those of you who are familiar with Moz – formerly known as SEOmoz – I’ve got a t-shirt to give away. 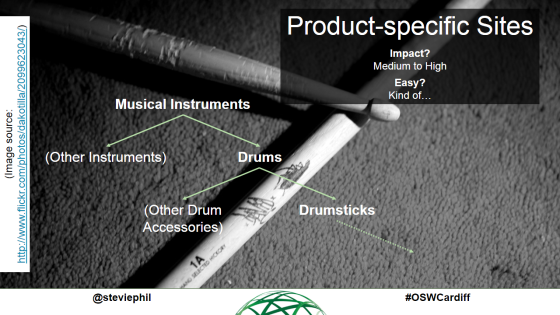 So one of the things I’m going to be talking about in the presentation. Keep your eyes and ears peeled, and you may have a chance to win it as a prize. So this is Danny Sullivan, he is the editor of Search Engine Land, a big SEO news site, he’s probably one of the most authoritative figures in the industry, and it was quite reassuring when he said: “believe me, link-building is hard.” It was reassuring because a lot of people in the past used to be a bit cheeky and a bit naughty and do some borderline spammy things. 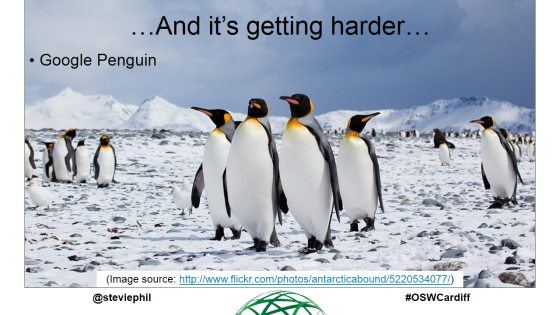 Google has really cracked down in the last couple of years with things like Google Penguin which is an algorithm update that tackles people using overly-aggressive link building tactics. They’ve also been a lot more open about telling webmasters if they’ve got a penalty or not, so for those of you who don’t know, this accessible in your Google Webmaster Tools, and it tells you whether you’ve got a Manual Action against your site. So if you have any worries or concerns that you may have had a penalty of some sort from Google, it might be worth just quickly checking and having a look. 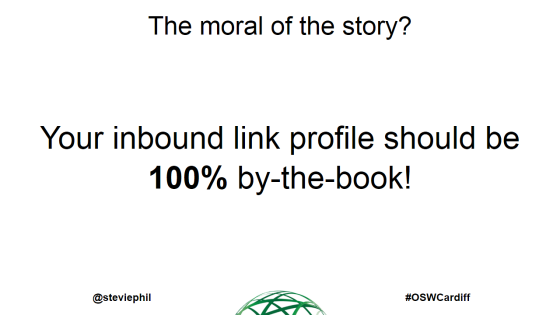 The moral of the story is your link building profile should be 100% by the book. 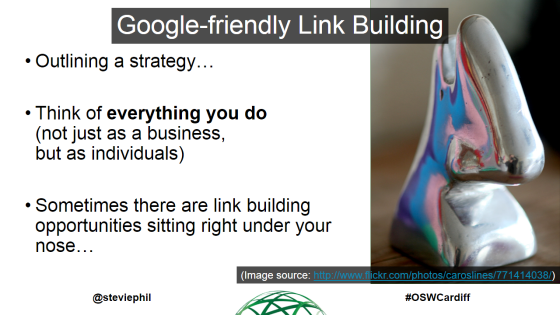 Your links should be natural. They should be genuine. You should think to yourself: “if Google didn’t exist, or if SEO didn’t exist, would I actually want a link from this site?” If the answer is yes, then great. If the answer is no, then it’s probably likely the only reason you would want that link is for SEO purposes and Google would have a problem with that. And I know it’s daunting because there are still some people who do the dodgy, naughty, spammy stuff and get away with it, but it doesn’t mean it’s impossible. 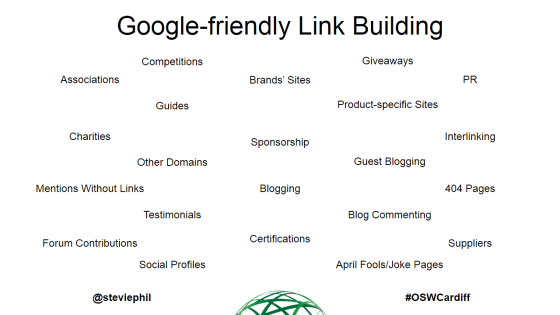 Google-friendly link building. When I sit down with a new client, I often think of, outline a strategy and think of everything they do. So not just as a business, but things that go on in their industry – there might be things in their industry, things that are relevant to their industry that maybe aren’t relevant to another, and even as an individual. So for example, if it’s a business owner who does a lot of charity work, then that might be a way to get links. 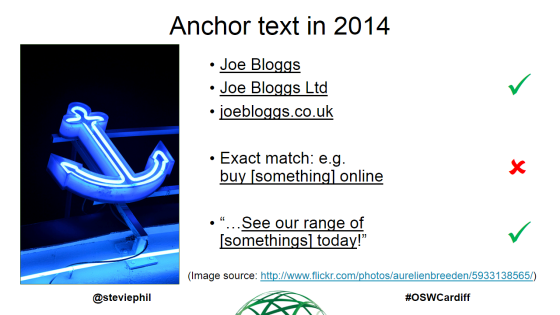 Even if it’s not about your business, you can still potentially get links to your business about that. And sometimes there are link building opportunities sitting right under your nose, and the idea of this talk is that I’m going to go through a whole lot, and hopefully you’ll go away thinking: “I can’t believe we didn’t think of that, we can implement that from tomorrow.” So, that’s the plan anyway. Here’s a bit of a long list… I wouldn’t go crazy writing all these down, the slides will be available on SlideShare afterwards, and I’ll be running through most of these, not all, the only ones I won’t be running through are quite obvious ones like blogging, guest blogging, things like that. Certifications. 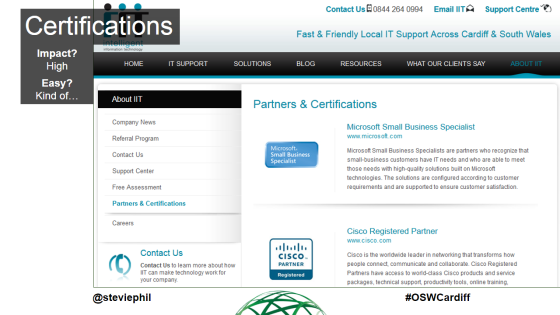 This is a client of mine who, not eCommerce, but they’re a local IT support company, they are partnered and have certification with Microsoft, Dell, HP, they’re looking to get certification with Apple. Now I said to them, first thing was: “are you actually listed on their websites?” Because some of those websites, like Microsoft, will say: “here’s a list of all the businesses with our certification,” or “here’s the list of our partners.” Because obviously they want you to use them. And they were on a few of them, but there was one or two where they weren’t, so straight away I said: “right, we’ve got to get you guys listed on these.” Because you can imagine how authoritative Google would consider the likes of Microsoft.com, Apple.com. Getting the link from there would be fantastic. And there’s also the added benefit that they should have a link from there, you know they could get referrals directly from people who actually navigate and use the directory properly who are looking for someone who’s Microsoft-recommended, for example. Another client of mine, I should say as a disclaimer, these aren’t all clients of mine, there just happens to be these first few slides, I think, happen to be. These guys do a lot of charity work. They’re musical instrument sellers, local for South Wales. 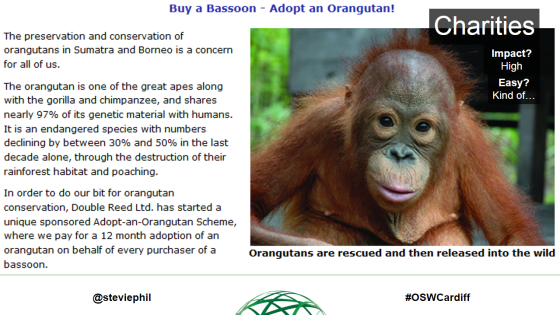 Every time they sell an instrument, they offer the buyer the opportunity to adopt an orangutan on their behalf. They’re very passionate about orangutan conservation. And a few people say no. Fair enough. And that comes out of their own pocket. I think, in the last year, they’ve sponsored about 30 or 40, adopted or conserved. And, it’s coming out of their own pockets, they’re not profiting from it, but I thought there’s an opportunity there for possibly local PR if not national PR. There’s the opportunity to get in touch with the charity and say: “do you know these guys are doing this, raising money for you in this way?” Even if not the charity directly, there might be orangutan conservation websites or general charity sites who would love to talk about it. So even though they’re not doing it for SEO purposes, there’s potentially a lot there they can leverage. So if any of you guys are doing anything for charity, whether it is individual or business, or something you tie in, it’s something to think about. And if you’re thinking about it, I mean with these guys, it’s a lot easier for them because they sell expensive instruments, so, you know, it’s only a little bit coming out of the sale. But if you sell lots of smaller products, you might want to say something like people who spend over £500 or £1,000, you’ll do this for them. And then there’s the added benefit there of actually it encourages them to think: “I might just spend a bit extra, and I’ll get this as well.” If they’re near sort of the borderline. Sponsorship: again another client of mine. I apologise, I think that’s it for the examples after this. This is a storage company in Cardiff, they sponsor a local rugby team and a local football team. They weren’t on either of the websites. 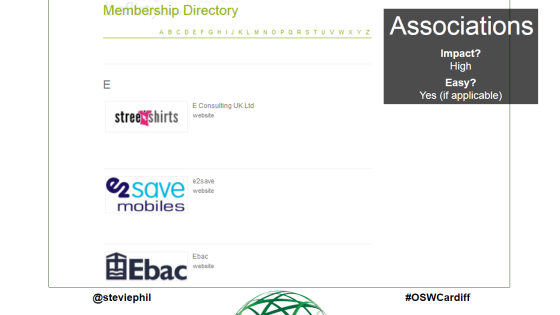 Even though the websites link to the people who sponsor them, they didn’t have links on there. The first thing I said: “we need to get in touch with these guys and say: ‘can you make sure to add the links to the proper section? '” So, a nice easy thing. 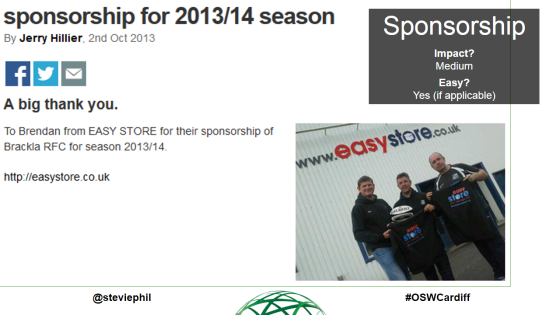 Obviously, if you’re already sponsoring something that could just be something you could just quickly check. And not limited to sports teams, it could be things like, I think, local radio stations often link out to people who advertise with them, and things with events and conferences as well. It’s something that might just be an accident, overlooked, that you haven’t been added to this list. Competitions and giveaways. This is an excerpt from a post by an industry peer of mine. An industry friend of mine, I should say. 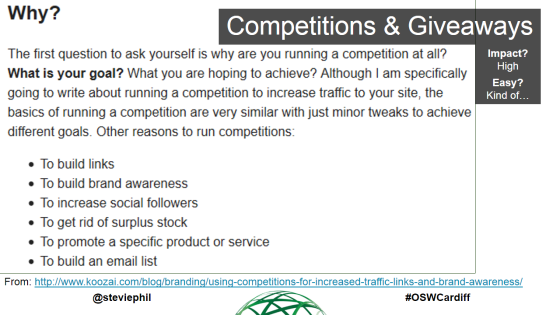 He loves doing competitions and giveaways, not only because it benefits SEO, but because it helps with your social media, it can help with your branding, it can help you with email marketing by helping to build an email list. And you can even use it as an excuse where you can get rid of surplus stock. Say if you accidentally order in too much of something, or you’re really struggling to get rid of something, have a giveaway. Because it’s stuff your sitting on anyway or stuff that you really desperately want to get rid of, or you get to the point where you think to, “I really don’t care if I don’t make a profit on this,” then there’s one opportunity for you and it could obviously benefit your marketing and your SEO. Brand Sites. What I mean by “brand sites” is when you appear, getting a link from brands that you sell, their websites, if they have websites. This has been gold dust for some clients of mine. One I have is an opticians and they sell about a dozen designer brands. adidas and Ray-Ban have on their websites: “here are places you can buy our glasses” and as well as listing shops, they actually list opticians. And they weren’t on either of them. So again, similar to the Microsoft, Dell, HP example I gave earlier, getting the link from adidas and Ray-Ban – blimey, so I’ve been trying to sort that out for them. This first example, this is a Vodka brand, I don’t think they sell online, and they sell through brick and mortar, through shops, and they sell this one in a Cardiff: Spirited Wines. The added bonus there is also if you’re the only local company, and people like to buy local or people think: “where can I get it in a shop near me,” there’s the added bonus. But it’s not just limited to, I mean, most of the times it will work out well for brick and mortar presences. You’ll have to forgive the rude example there, but I think this brilliant. 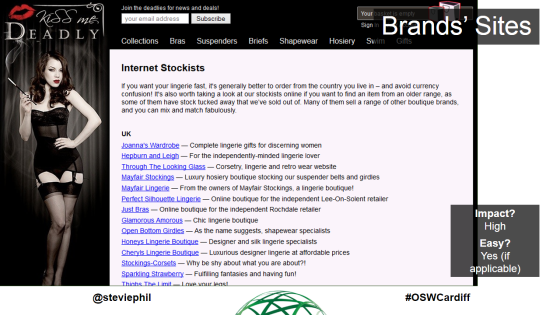 This lingerie website, even though they sell the products on their own website, they also link to all their stockists, even other internet stockists, so even if you don’t have a brick and mortar presence or shop and you purely have an online site, then you can still get a link from here if you sold that product. So, I mean, hopefully this is something you guys can take away with. If you sell 50 brands, you can look and make a list of all of them, find out the websites for all of them, if they have websites. 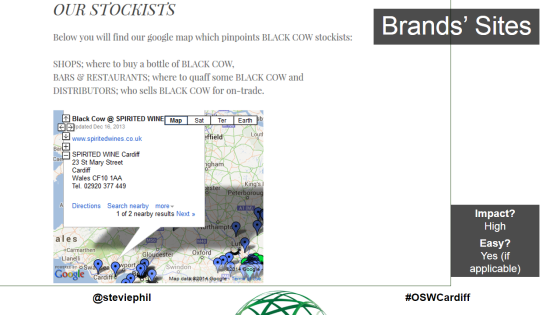 Some of them might have websites, some of them might not link out to stockists, resellers, but you know there might be 5 or 10 links you can get out of that, for example. If that might not be a viable option, something that’s related is doing testimonials, which, as you can see here, this is a hosting website, and if you say some nice things about them, you’ll get a link. 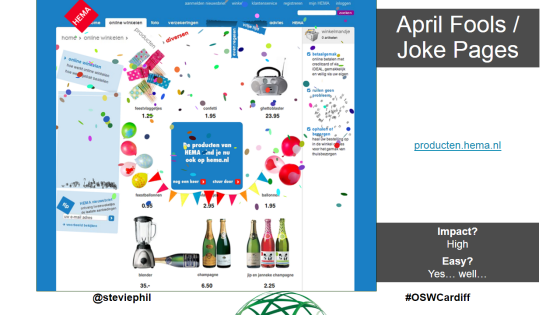 So, I mean, think, I used web-design in the last example, but who does your hosting for your online business? Who is your accountant, if you use one? If you have, say, a WordPress site and use plugins, do those plugins have websites? And if so, do they have testimonials? Can you get links that way? So there’s a few opportunities there. What you try to do is think: who are you the client of? As opposed to the other way around. 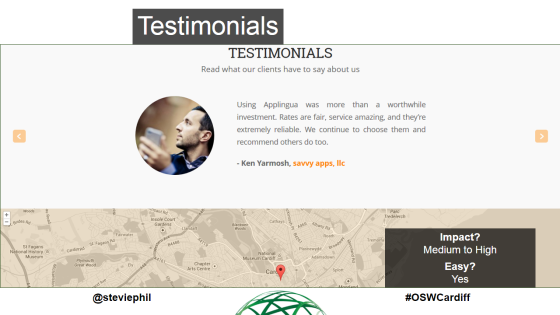 And I wanted to throw this example in as well because it’s a local company Applingua down the road, and they do it as well, where they link out to people who leave them testimonials. 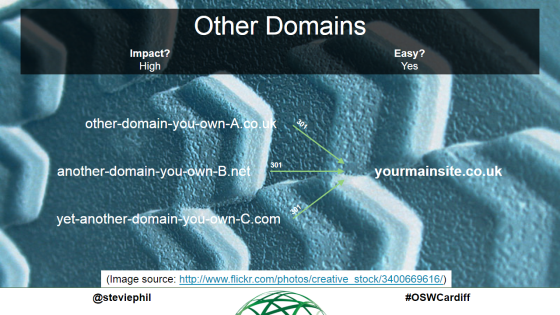 Other domains. So, not really a link building technique per se, but I had a client who owned about 10 other domains next to his main one, they were things like a .com, a .co.uk, other variations, with and without a hyphen in the middle, he had some old keyword domains which were like the keyword he wanted to rank for other than his business name. Some of them weren’t redirecting at all, they were just like the standard holding page that you get when you visit a page that’s been registered, you know, those kinds of pages. And some of them were 302 redirects which are not Google-friendly. Or they didn’t pass any SEO benefit. So I asked him for his login details, I logged in, and 5 minutes later all of them had 301 redirects, which really would have helped them out straight away, I imagine. And some of them had links of their own accord, people who had linked to the wrong version, they’d linked to the .com instead of the .co.uk, or they’d linked to the version with they hyphen, so some of them had links and they weren’t actually passing that benefit onto the main site, so it was a no-brainer really. So it’s worth it if you’ve got a list of other domains, just check and see that they’re doing what they should be doing and redirecting properly. I’m a 1&1 customer and I found out recently that they only use 302 redirects if you only have domains with them, so I’m looking to move from them because 302 redirects are not very SEO-friendly. It’s just something to bear in mind as well, its worth, there are tools out there where you can check what kind of redirect it is, just to double check, make sure you’re getting the value there. Mentions without links. So, I’m sure many of you here will be familiar with Google Alerts. Google Alerts has seemed to have apparently died a death and doesn’t seem to be working any more. At least that’s my experience. I use Fresh Web Explorer provided by Moz, but I’ve heard good things about Talkwalker and mention, and I’m hoping to try them out soon. I use Confused.com as an example, not only because I used to work there a good couple of years ago, but also because even though their name is a domain name, it’s Confused.com, people still don’t link to it. So it’s worth having something in place, that just alerts you every time your business name is mentioned, or your domain name is shared, whateveritis.com, and just having a quick look and making sure that you are actually linked to or that the link is working properly. And if not, say if you’re mentioned on a blog, you might be able to get in touch with the blog owner and just say: “hey, listen, can you do us a favor? Thanks for mentioning us, but can you throw in a link as well please?” It’s just something to have in place, and then it can just be something to fire once and forget. You can set the alert and then let it take care of itself. And then sometimes you get the email, something might crop up. Double-checking social profiles. You’d be surprised, there’s been a couple of times when I’ve seen somebody who’s set up a Twitter account, and they’ve done it in a hurry, and it’s one of the things they’re doing, especially when they’re starting a new business, they have a list of a million things to do including set up social media profiles, and they do it so quickly they don’t realize the link is wrong, or they could have added a link but haven’t. So things like Twitter, Facebook, Google+, LinkedIn. If you hire any staff, and they’re on LinkedIn, it’s worth checking to see if they’ve got a link in their profile because they can have a link to a company website, so if you’ve got 10 staff, that’s a potential for 10 other links. 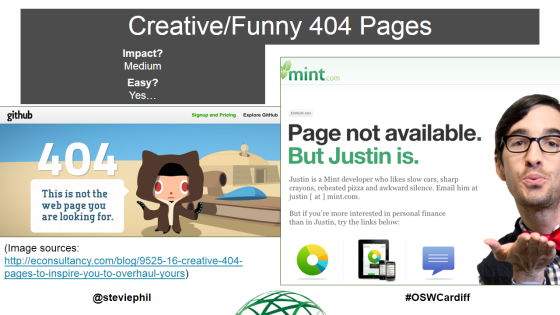 Creative and funny 404 pages. So, your error pages. These are examples from GitHub and Mint.com. GitHub is a gentle nod to Star Wars and Mint.com is pretending to be a dating website. I think Mint.com is a finance site if I remember correctly. One of my favorite examples I should have included, it was on a music website and said “Page Not Found” and showed the lineup of Led Zeppelin with Jimmy Page silhouetted out. Which I just thought was genius. Probably helps because I’m a big Led Zeppelin fan. But it gets people talking. People love it, people find it funny, people like to share about it on social media, get picked up by PR. Econsultancy who are a big sort of online marketing blog and website, they love to share 404 pages, so you can do one for your website, and even, you know, they might pick it up. And similarly, April Fools and joke pages. I don’t know how many of you are familiar with this, it’s from the Netherlands I think, where it starts off looking like a normal eCommerce page and then things start going wrong, and the champagne bottle cork fires and hits the blender, and the blender knocks some balloons, and the balloons knock the radio on, and eventually the page just falls apart. And the great thing is, it’s years old, but people are still talking about it today. I still see somebody mentioning it on Twitter. It’s just something you can be doing where you have a joke page, that you know, gets picked up by PR and gets talked about socially. It can be high impact, as it says there, depending on what you go for. It’s easy if it’s something simple. You know, just a bit of text or something like that, but obviously if you go to the extent that those guys did, then obviously you might need some outside help, or you might need to be quite technologically savvy. So it really depends, that one. I hope you’ve learned something new, and there are a couple of things that you might be able to go away with and think about and start to implement for your business. If not, I’ve got a weird sense of humor, I apologise. 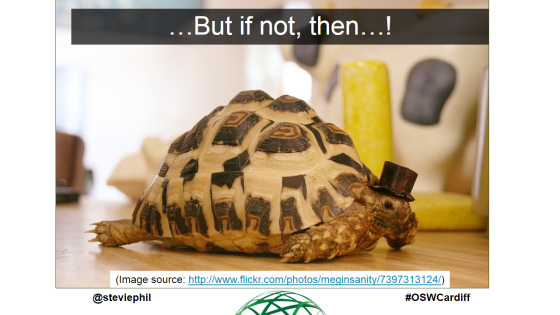 The best I can do is offer you this picture of a turtle in a top hat. I’m glad people laughed, because I thought that’d be really awkward if they didn’t. I thought people would think: “what a weirdo.” So, thank you, thank you for laughing. Audience Member: Is it your turtle? Because I’ve gone through that quickly, I was going to skip this section because I thought I was going to overrun, but assuming I’ve still got a bit of time, Prabhat, I’ll just quickly go through this one. 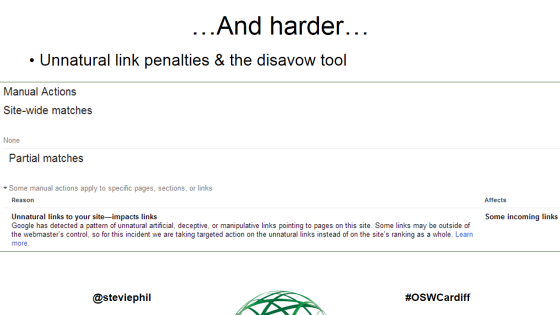 As long as it reads well and it looks genuine, then I think that’s fine, but if every single instance of every link pointing to your website looks like the bottom, I would go on Webmaster Tools and look at that penalty thing just in case, at the Manual Actions tab. But if it looks like the top where people link to you with, or you’ve gotten links from places and when they’ve asked: “how do you want the links to appear?” When you’ve had to roll over it, it’s your name, it’s your URL, it says click here, it’s a specific website, and it’s very broad and very varied, that’s going to benefit you a lot more than what people used to get away with a few years ago. I think that’s it. We’ve now got the Moz t-shirt to give away, as I mentioned at the beginning. So, the first person to shout out the answer to this will win. Steve: No. It wasn’t the baboon. My backup question was going to be what was the animal? And it was an orangutan, so you still got it wrong! 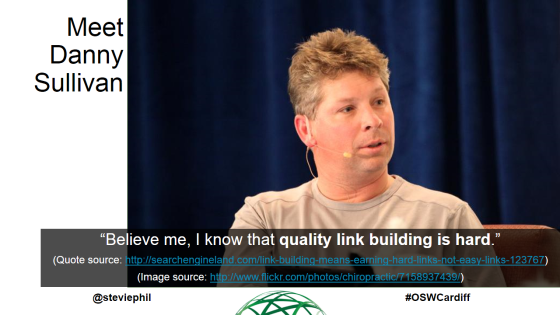 The question is… No, unless you get this one, the question is, right at the beginning of the slides, I talked about the editor of Search Engine Land, the guy who said, “Link-building is hard.” What’s his name? Steve: Correct. You’re the proud owner of a Moz t-shirt, if I could grab you afterwards to grab your name, address, size, etc., and then I’ll pass the details onto Moz, because I haven’t got the t-shirt yet. Fair enough. All right then, everything I just said to you I’ll say to you, if you could grab me afterwards, I’ll grab your name, address, and size and everything and I’ll get them to send it to you. And that’s everything. 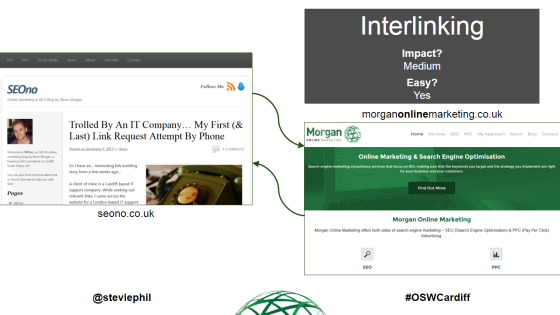 So if you’d like to keep in touch with me in a less frantic setting where I don’t ramble at a ridiculous pace, that’s my blog at the top, SEOno, @steviephil on Twitter, and morganonlinemarketing.co.uk is my freelance website where I say that I do SEO and PPC business. So thank you very much. Audience Member: You said that that slide was going to be somewhere? Where’s that going to be? 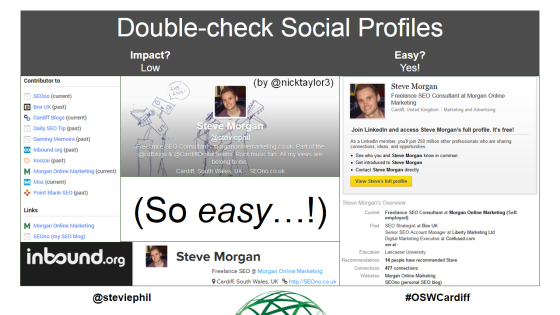 Steve: On SlideShare. I was going to put it on like tonight, tomorrow and if in doubt I’ll probably tweet about it and then also I’ll probably do a blog post about it, but yeah, if Prabhat emails it thenn even better. I’d just like to say again thank you to Prabhat again for hosting this event. Audience Member: Thank you very much Steve. Many of us, some of us here, do sell on eBay, some of us were thinking to start selling in our own store, in our own branded store, it’s just, where do we start, and how do we start? What’s the first step? Steve: For creating your own website? 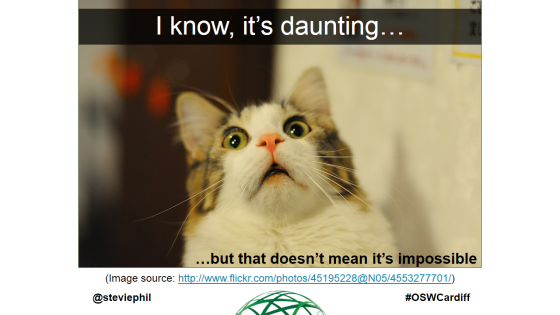 Audience Member: Yes, and when we create our own website, do we outsource to somebody else? Should we outsource SEO to you? Or can it be done in-house? 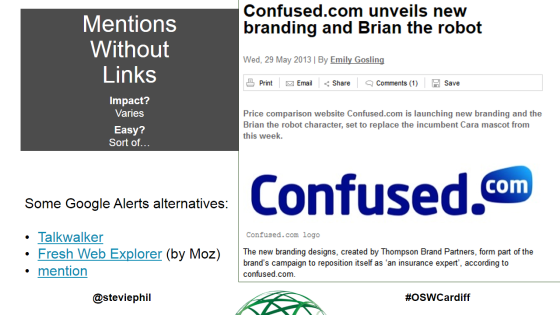 The issue of somewhere, starting somewhere, in the right way, because I think not all SEO people do it in the right way. You did mention the black-hat and white-hat, so what do you suggest? Steve: Yeah, that’s a good question, thanks Prabhat. The first thing I should have mentioned is obviously my talk was directed to if you have your own website and optimised/driving links and trying to get people to your main own website as opposed to an eBay or Amazon store, so apologies, I should have made that clear from the beginning. In terms of going about the steps, I’m not a web designer, so I’m not able to recommend too much on some of the eCommerce platforms. Magento is a very popular one, I’ve only had a brief experience with that one doing on-site stuff. I believe now WordPress, which I’m very familiar with – from a non-eCcommerce standpoint, you know, like a brochure website, things like that – WordPress can let you use plugins where you can, you know, add your products, things like that. I think the advice would be to read up a lot about what kinds of platforms available. Because it’s one of those things. It’s bad enough even with a small brochure website with a few pages, if you want to change the website it’s an upheaval, but if you’ve got an eCommerce website with hundreds of products on it, it’s going to be even more, so you have to do your research and due diligence. In terms of working with companies, again, it really depends, if you’re confident enough. A lot of the link building techniques I suggested there, you don’t really need to necessarily hire someone like me to help you do them. They’re things you can do of your own accord. So, it really depends. And with making on-site tweaks, a lot of it you may be able to read up on yourself. But my advice would be to look at various websites, Search Engine Land, I mentioned, always tells a lot of news. 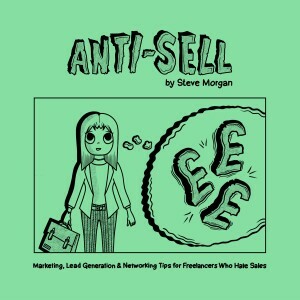 Moz is great – I’m not affiliated with them, but I’m just a big fan, and that’s pretty much how I learned SEO back in like 2009, basically just reading a lot of Moz blog posts, and so it’s really your choice whether you want to do it yourself or hire somebody to do it for you. I think the best approach is if you, don’t hire someone to do it for you and almost think: “I’m going to pay you, I’m going to forget about it, I just want you to go off and do SEO, and I’ll have higher rankings.” I think that’s not the best way to do it, because, you know, they might be going off and getting links completely independently of everything you’re doing, and there might be opportunities they’re missing. Like they might not know that you’re involved with charity work, or that you’ve just created a new, fancy, creative 404 page that could be really popular if it was shared. I think the best thing to do, and I encourage this with clients is, it’s more of a collaboration. Instead of me just going off and doing SEO, or them doing it all themselves necessarily if they haven’t got the time or the skill level or confidence. It’s kind of a bit of to and fro. I help out, but ultimately, and this is the case with one client, it’s getting to the point where I sort of coach them and train them, and I think they’re at a point where soon they’re going to say: “thanks Steve, we’ve got it from here.” And I’ll say: “my work here is done.” And walk off into the sunset. But, yeah, I hope that kind of answers your question. Anyone else, any other questions? I’ve done a bit of link removal work. I actually got a penalty revoked today, I found out, so if anyone has questions on that I can quickly cover that if we’ve got time. Audience Member: Linking off Facebook pages, do they add value to your website? Even a little bit? Do you find that it helps pages rank a little bit better? If people actually physically get the link off a public profile page, is that added value? Steve: I think, I think Facebook, like some of the other social media websites use nofollow, which is something Google issued a few years ago, and a lot of social media websites use, to ward off people from doing blog comment spamming, forum spamming. People just go, you go on a old, neglected forum, and it’s just tons of people advertising, and so they did this to stop people from benefitting from an SEO point of view. Audience Member: I actually watched it yesterday, and he said that: “we are not actually, it’s just rumor, we’re not actually using Twitter and Facebook” because of the volatility and a lot of people keep changing their privacy, you can’t use it as concrete referral material, so they’re discounting it. Audience Member: That’s actually for private accounts. When it’s public, it’s different. Steve: That’s really interesting. Thanks for sharing. 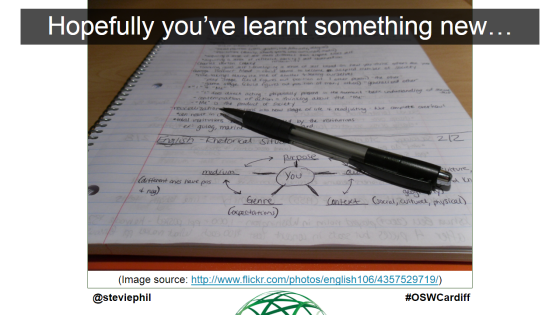 Audience Member: SEO stuff can get complex. Steve: I was going to say that. It should be, yeah, sometimes, I mean it would be a bit dodgy if they said: “oh yeah, we don’t count it,” and they did. But you’ve got to wonder, Google are very sort of secretive about some stuff they do and sometimes they throw curveballs or throw you off the scent. So that’s a very good point. That could be the case here. Yeah. Ok. Thank you everyone.